Last month I joined Org Junkie in the 29 day Organizational Challenge and I actually completed it! I know, I was shocked too. So when I saw that Tsh at Simple Mom was going to do a month long Project Simplify I figured why not try my luck and go for 2 months of decluttering. I’m a glutton for punishment these days. Luckily for me, week one involves kids toys and a big part of our kid toy clutter was in the living room. The same living room that I tackled in Org Junkie’s challenge. But since that was only last week, I am going to show off my work again. Face it people, I deserve to show off that nice organized space because it took a month to get it organized. I’m milking that puppy for all it’s worth! So these pictures might be a repeat for regular readers- just ooh and aah and pat me on the head anyway. Your cooperation is appreciated. 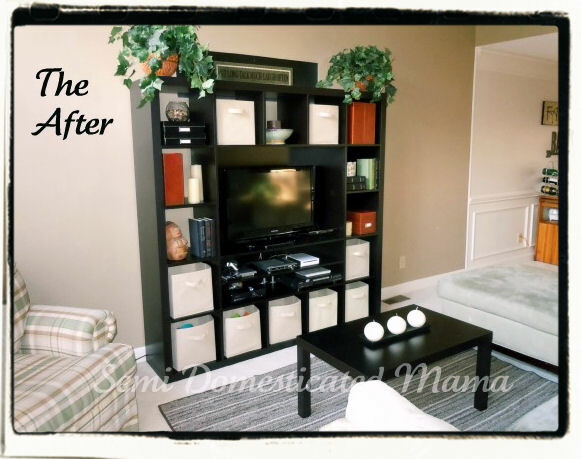 Let’s take a little glimpse at the Before pictures of the living room with special focus on the entertainment bookcase that was housing the majority of kids toys, books and movies in the house. 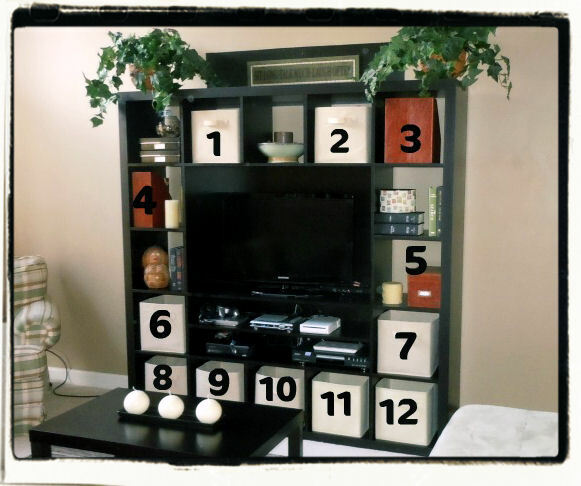 The entertainment bookcase. The bane of my organizational goals. I call it the Clutter Catcher. 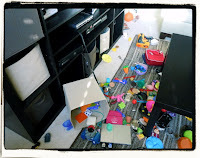 The canvas bins are a great tool for separating categories of toys but only if the kids actually use them for that purpose, which my kids did not. You would not believe the things I found inside these bins. Popsicle wrappers, fruit snack wrappers, random articles of clothing, overdue library books, an unopened bill….I’ll spare you the rest but sufficed to say I was horrified. First thing I did was take every single bucket out of the unit and dump it all out in the middle of the floor. I separated all the like categories and decided what would be allowed to stay in the living room and what needed to find another home. It was a huge job. I purged more than half of the contents which gave me the brilliant idea to stage the bookcase with more than just canvas bins and clutter storage. Are you ready for the after? Are you? #1- I pared down all the video games and accessories into one bin. All the game cases were stored in the garage in case the kids want to trade them in later and the actual discs were stored in a CD binder for easy access. #2- I used this bin to hold all my gift bags, tissue paper, streamers, balloons, etc. All that stuff that desperately needed an easy to access home instead of being spread out around my whole house. #3- I bought these leather magazine holders at Office Depot about a year ago on clearance for $0.94 each but had nowhere to use them. I just couldn’t pass up the clearance price so they’ve been sitting in the closet for a year. I used them to hold the kids coloring books, activity books and notebooks. Best part? They can’t reach them so they have to ask me for help which ensures that I won’t walk in to find all 50 books spread out all over the house. #4- I had one magazine holder left over so I used it to hold my magazines that I’m waiting to read. I get a lot of magazines and sometime they accumulate on my kitchen counter. Now I can come in straight from the mailbox and put the magazines in this holder. #5- I bought this CD box at the same time as the magazine holders because it was on clearance for $1.46 and I cannot pass up a deal. It was sitting in the closet with the magazine holders. I used it for kids movies. We had 5 buckets of kids movies in the cases. 80% of them were movies they didn’t watch or had outgrown. I sorted through every single one, purging the movies that were too scratched to watch or that the kids were not going to watch again. The ones that I kept were taken out of the original cases and store in thin CD disc cases with clear fronts. That box is less than half full! Now the kids can actually see the movies and enjoy some of their favorites instead of dumping out 5 buckets to search for something to watch. #6- This bin holds all the Leap Frog stuff- the Tag pen & a few books, the Explorer & games, and Zoey’s little leap & learn toy. #7- This bin is empty! I didn’t need it but I like symmetry so I had to use it. Ha! #8- This bin is holding all the mega bloks. We had a ton so I pared them down and put a small bucket of them in Zoey’s room for her to enjoy when she plays by herself. By splitting the large set it makes it so much easier to clean up after playtime. #9- This bin is holding the kitchen play stuff. I purged about 70% of the kitchen toys. I kept the ones that go with Zoey’s little Discovery kitchen and her Leap Frog picnic basket but a lot of other random kitchen stuff that was not part of a specific set was sent to the Goodwill pile. #10- I used this bin to hold a few of Zoey’s favorite stuffed animals and dolls. The majority of her animals and dolls were relegated to her bedroom toy box though. #11- This bin is holding some of Zoey’s favorite board books. Most of them are in her room but I left a few down here for her to read during the day. #12- And another empty bin! I didn’t want to fill it up just because it was there but in the future if I need space for toys, I have it! All the toy cars went up to Mase’s bedroom, all the Little People toys went up to Zoey’s bedroom, all the arts & crafts supplies went up to Maia’s bedroom and the remainder of the books were distributed between the kids bedrooms. I cannot even tell you what a difference this had made for our family, especially for me! It takes me no time at all to pick up when I get that last minute ‘Hey we’re in the neighborhood, can we stop by for a visit’ call because it’s so easy for the kids to put away their own toys. Plus, as an added bonus it makes it so much easier for me to Fake Clean the House before Mr.McHunky gets home at the end of the day. That is what I call a Win/Win, my friends. I pledged at the beginning of the month to accept Org Junkie’s 29 Day Organizational Challenge. Remember? I showed you the disaster that had become my living room space. 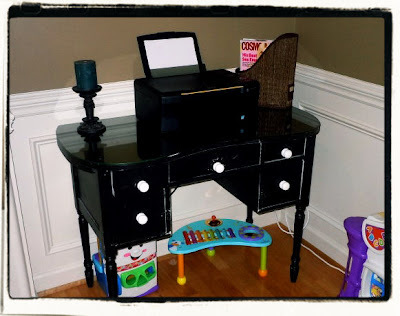 I bit the bullet, swallowed my deep shame and I shared the before pictures of my foyer closet, the entertainment bookcase, the foyer cabinet and the computer desk. Oh, the shame. A week after I shared my initial shame, I showed you the progress that I was making. 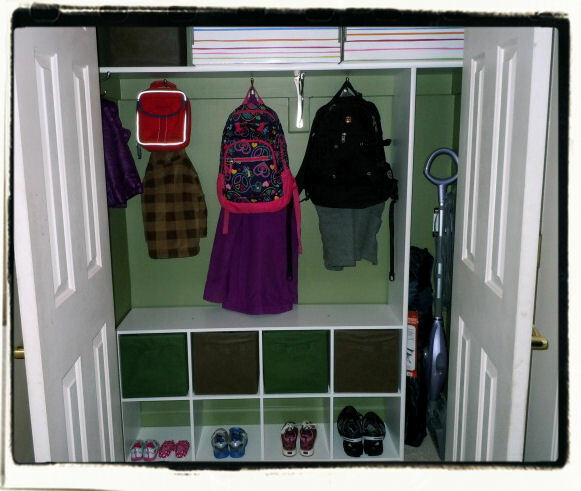 I showed you how I stripped the foyer closet down to the bare bones, painted it and had Matt build me a Locker/Cubby style closet organizer. My progress stalled out after the first week and I lost some of my mojo when my kids got sick and then I got sick and then they got sick again. You see the pattern? I was determined to finish this challenge so I mustered some of my tattered mojo and soldiered on towards my goal. I tacked the smaller jobs first. 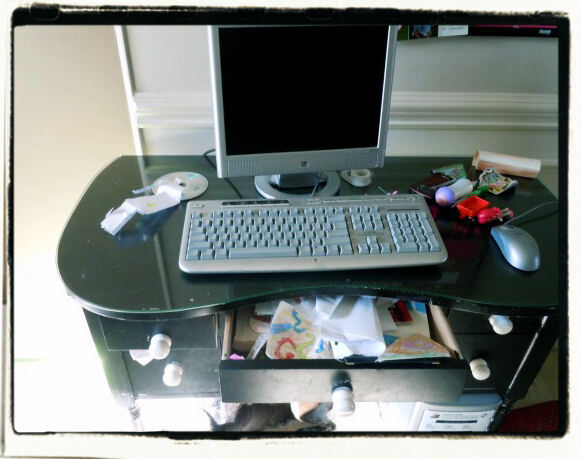 I realized that by having the computer desk with the old desktop computer in the living room, I was inviting the kids to shove random papers inside. Nobody uses that old desktop computer, it’s a dinosaur that moves at the speed of a dead turtle. The only reason it was still hooked up is because I had yet to transfer some of the pictures saved on it to disc. I dragged out my huge pile of CD disc’s and got to work saving pictures. I separated them into months and saved one month on each disc. I labeled each disc and have them stored in a large CD binder for easy access. The old dinosaur computer is now in the Goodwill pile that is accumulating in our garage. By removing the computer I was able to bring the computer desk into the family room and use it to hold my wireless printer and office supplies. I cleaned out every single drawer and pared it down to only necessities. It feel so good. 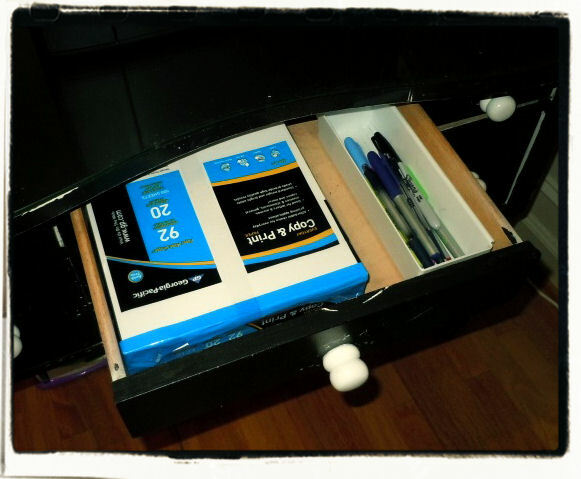 If I need a pen, I can find one. I have printer paper that does not have drawings of random cartoon characters all over it. I know, it’s super exciting. Then I tackled the black cabinet that was hiding all the unsavory clutter by the front door. I cleaned it out completely and wouldn’t you know, half the stuff belonged in either other parts of the house or in the Goodwill pile. I was able to fold and store the throw blankets in there as well as a magazine file that holds things I am saving for my sister. I stored part of the Leap Frog Tag book in there so I can rotate them out every couple of weeks and I found a spot for the extra candles. You hear that Mother Nature? Next time, I will be prepared for your wrath and fury! You shall not catch me in the dark with my pants down again. Figuratively speaking, of course. After finishing up the small projects, I had to move on to the most difficult. The entertainment bookcase. The bane of my organizational goals. I call it the Clutter Catcher. The canvas bins are a great tool for separating categories of toys but only if the kids actually use them for that purpose, which my kids did not. You would not believe the things I found inside these bins. Popsicle wrappers, fruit snack wrappers, random articles of clothing, overdue library books, an unopened bill….I’ll spare you the rest but sufficed to say I was horrified. First thing I did was take every single bucket out of the unit and dump it all out in the middle of the floor. I separated all the like categories and decided what would be allowed to stay in the living room and what needed to find another home. It was a huge job. I purged more than half of the contents which gave me the brilliant idea to stage the bookcase with more than just canvas bins and clutter storage. I know, my brilliance astounds you doesn’t it? I cannot even tell you what a difference this had made for our family, especially for me! It takes me no time at all to pick up when I get that last minute ‘Hey we’re in the neighborhood, can we stop by for a visit’ call because it’s so easy for the kids to put away their own toys. Plus, as an added bonus it makes it so much easier for me to Fake Clean the House before Matt gets home at the end of the day. That is what I call a Win/Win, my friends. 1.What space did you decide to organize and why? I decided to organize my front living room, including the foyer closet & cabinet, the entertainment bookcase and the computer desk. I chose this area because it’s the very first thing people see when they walk in my house. 2. What steps did you take to ensure you completed the space within the 29 day timeline? I broke it down into steps. I chose to do a large project (the closet) first, the 2 of the smaller projects (the cabinet & the computer desk) and then tackle another large project (the entertainment bookcase). I planned it all out before I started and gave myself a deadline. I also promised myself a Mocha Frapp with whip if I finished each one on time. Yes I can be bribed like a 4 year old. 3. What was the hardest part of the challenge for you and how did you overcome it? Finding the time in the day to actually finish the project that I started. I knew if I started one and didn’t finish it that day I would never get it done. 4. 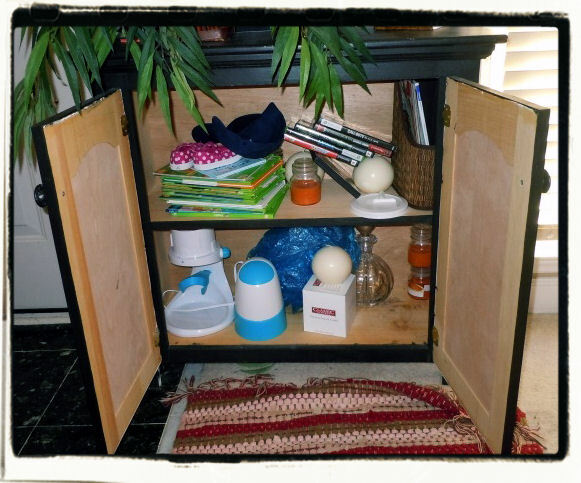 What did you do with the “stuff” you were able to purge out of your newly organized space? We are donating it to the National Kidney Foundation for charity. They will be here on Monday to pick it all up for me! My dad is a Kidney Donation Recipient so this charity is especially important to us. 5. Tell me one of your proudest moments during this challenge? 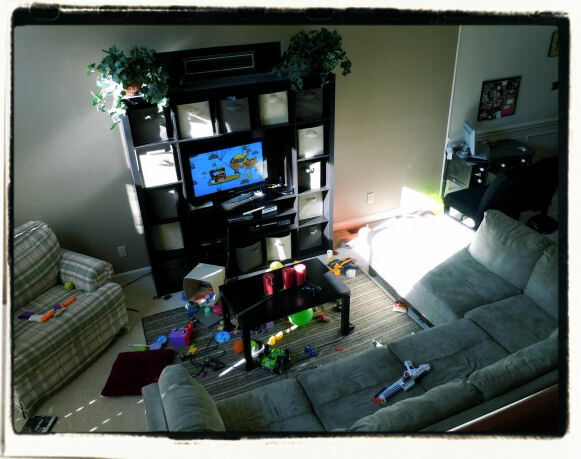 Realizing that my front room actually looks like adults might live in this house along with the kids. It’s a space that I’m not embarassed by when I open the door now. 6. Explain any organizing “tools” you used to help you create additional space and to establish some limits and boundaries? I didn’t have to buy anything, all the stuff I used was from around the house. I took out most of the canvas bins in the entertainment bookcase to make sure we couldn’t just fill them all back up again. In the closet I purged anything that didn’t fit, wasn’t used or we didn’t want and I took inventory of what I kept so I wouldn’t be tempted to buy replacements. 7. What is ONE piece of advice you’d give to someone else to encourage them on their organizational journey? Just jump in and start. You’ll be surprised at how easy and fast you can accomplish some major projects if you break them down into smaller, less daunting ones and just jump in with both feet. Oh, and promising yourself a nice tasty treat when you’re done helps too. Do you have an area in your house that is screaming out for some help? Some organization? Some decluttering? Some gasoline and a match? Are you needing inspiration or motivation to get it done? Well then join me in doing Org Junkie’s 29 Day Organizational Challenge. Come on, you know you want to. Peer pressure, peer pressure. I’m a terrible influence. Dr. Phil says the definition of insanity is doing the same thing over and over expecting different results. Well slap my bootie and call me insane because that’s what is going on around these parts. I have an area in my house that is a clutter collecting, destined to land me on Hoarders, quick call the health department, disaster. And, ready for the kicker? It’s the very first thing people see when they come in my house. I know. Did you just shudder in distaste? Did you feel a moment of pity? If so, thank you and keep reading. It gets worse. I’m going to post pictures. Mom, don’t look. 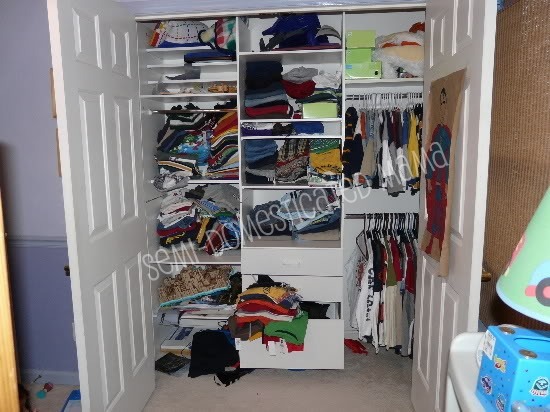 First up, we have the front closet. Oh My Gah, ya’ll. It’s terrible. Stuff gets shoved inside and the doors get closed to contain the clutter. But now, there is so much clutter that it’s spilling out into the foyer and into the living room. I swear the clutter breeds overnight. Like bunnies. 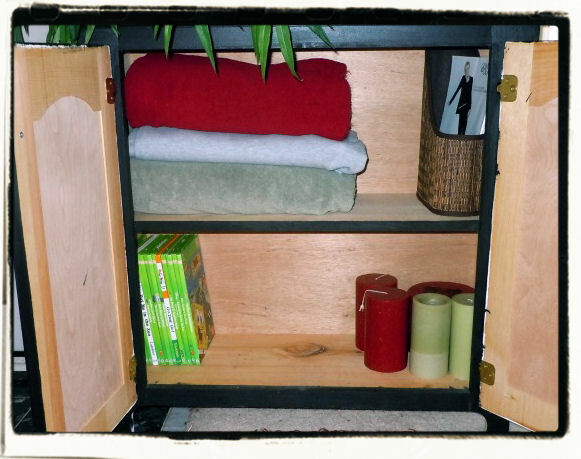 Next up on the Tour of Shame is the little black cabinet by the door that is intended to house specific things- like the extra throw blankets, the coupons and magazines I save for my sister, the outgoing mail….instead it gets stuffed with random things and the doors get closed to hide the shame. I mean, look at this disaster. All this is from two bins. Two. And last but certainly not least, the computer desk. Good gravy, the computer desk. It’s a disaster and something has to be done about it. February is the month that all this gets cleaned out and organized. I have some great ideas and plans for these areas so I hope you stay tuned to find out what I’m going to do to Declutter and Organize. This house needs some organization. There are many children living here…with their stuff. They have a lot of stuff. Our house is overflowing with stuff. I have made my list of places that require organizing/remodeling and I’ve put them into categories: Minor, In-Depth, and Bring the Dumpster. Sadly, most fall into either the In-Depth or the Bring the Dumpster category. Matt was darn near hyperventilating when he saw my Master List for 2010. I think he saw the tax return disappearing almost as soon as it hits the checking account. I tried to show him my plans and to explain that the majority of them were all about moving existing things to new places to maximize storage and organization. I don’t think he heard me though, he was too busy trying to make the ringing in his ears stop. 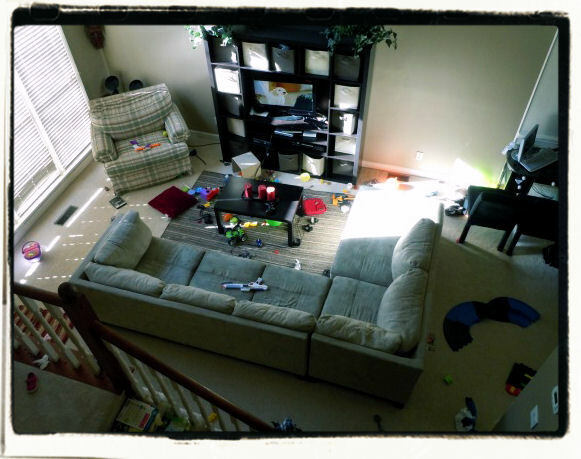 The first major project up on the list is The Big Playroom ReModel. It involves a lot of moving around of furniture and a lot of getting rid of excess clutter and old toys. I am super excited about this remodel. The kids are getting older and I’m trying to make the playroom into more of a second family room. The second major project up on the list is Mase’s Big Boy Room. The toddler bed, which was converted from the crib, is going to be put up in the attic. I would get rid of it but the last time we got rid of all the baby stuff, I got a Big Fat Positive on a pee stick the next week. No kidding. We had a yard sale on a Saturday and I sold all of our baby stuff- the cradle, the crib, the toys, the swing, the stroller, the carseat, the bathtub….everything. 5 days later, on Thursday, I peed on a stick and dollar signs started scrolling past my eyes. I will not be making the same mistake again. The crib and all other baby items will gather dust in the attic until I hit menopause. Ahem. Where was I? Oh yes, Mase’s Big Boy Room. The chest of drawers in his room is heading for Ty‘s closet and Mase is getting the white armoire that used to be Maia’s. I spent yesterday sanding, cleaning and painting a wood headboard and footboard that I picked up for $5 at a yard sale over a year ago. It’s been gathering dust in the garage since then. I gave it 2 coats of white paint and it will fit nicely with his sailboat themed room. I’ll add some new linens and his big boy room is done. Which leads to the next big project. Ty‘s room. Maia got a brand new remodeled room in October, which was a huge undertaking but so worth the work. Now Mase’s room is being redone. All that is left is Ty‘s room. He finally picked out the bedding he wants and I found most of the other decor that I want to use. He’s getting the old corner TV stand from the playroom and the older 19″ tube TV with a DVD player and the Playstation 2. This will be the first time he’s been allowed to have a TV in his room, but he’s 9 and quite frankly he’s tired of watching Elmo with Mase and Max & Ruby with Maia. I cannot blame him. He will not have satellite access, just the DVD player. Right now there is a desktop computer in his room that Matt uses for the budget as there is no internet access anymore on it. That is being recycled and we’ll be buying a nice new desktop to keep in the family room. The laundry area is getting a mini redo as well. That’s just a portion of my project list, I’m tired just reading it! I’m on a roll. And it feels good. 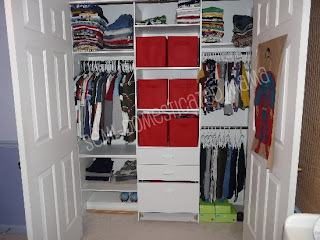 This past week I tackled the big boys closet. It was scary. Ty had 3 seasons worth of clothes in there and they were all mixed in together. Which made getting him ready for school in the morning fun….really fun. Scary, isn’t it? I hope you all realize how hard it was to post that picture. I had to visit my inner well of deep courage. 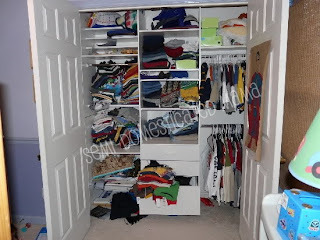 I started by taking every single thing out of that closet. I enlisted the help of the short people. They can destroy anything in 5 seconds flat, time to put some of that chaos to work for me. Then I reconfigured the closet organizer system. It just didn’t work. The kids clothes got all mixed in together and quite honestly, putting the laundry away in a closet that looks like that is a real chore. Which is why their clean laundry ended up stacked in the laundry basket for the entire week, unfolded and mixed up from trying to find clothes to wear every day. Chaos. Isn’t is purty? 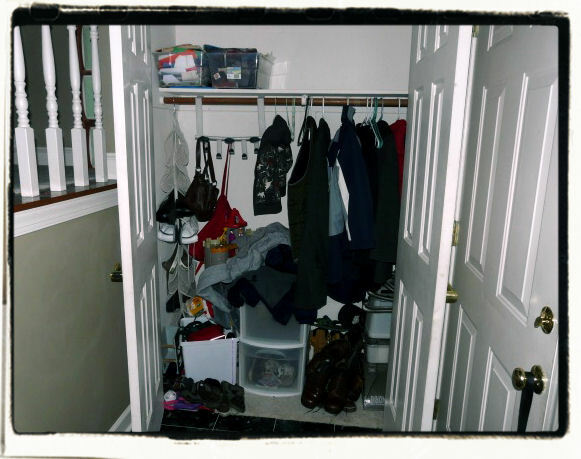 I gave each boy his own side of the closet. We are right in between seasons in our state and it’s 82 degrees one day, 45 degrees the next. Drives me insane, pick a damn season already why dontcha. So I had to be able to fit both winter and summer clothes in the closet. But they have so. much. stuff. I had to sort it all out. 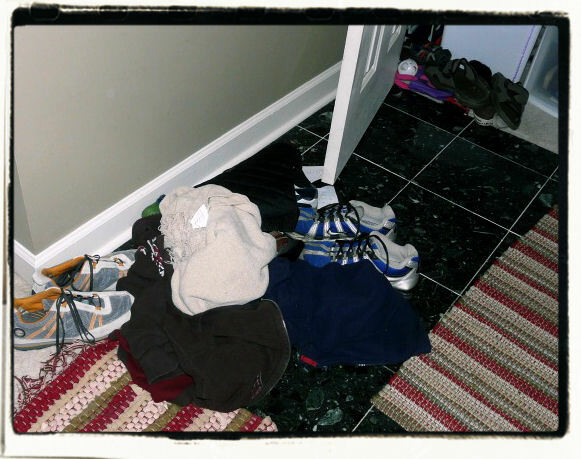 I made 3 piles for each boy: donate, storage, closet. Anything they have outgrown that I don’t want to sell next season, I donated. I ended up with a huge garbage bag of donate clothes and shoes. Anything that they wouldn’t wear again this season, like sweaters and thicker pants, I put in Large Rubbermaid tubs labeled Boys Winter. Then I separated the rest of the clothes into seasons. The long sleeved shirts got hung up. The shorts and tshirts got folded on the upper shelves. Ty’s pants got folded on the bottom shelf and Cam’s pants got hung up. I gave each boy one drawer to hold their undies, socks and PJ’s. The bottom drawer holds their dress up costumes- all 500 of them. I bought the red bins at Tar-jay and used them to separate and sort their smaller toys. I’m forever stepping on legos, Star Wars action figures and transformers. Now they are all separated and sorted. It’s official. I’m an organizing addict. Where’s the nearest 12 step program?